Venues, such as sports complexes, theaters and performing arts complexes, convention centers, hotels, and other event locations and venues, have traffic from a variety of drivers: semi-trucks, local delivery vehicles, charter buses, public transit buses, school buses, taxis, limos, utility trucks, and guests' personal vehicles. Carefully planning or revising the traffic patterns around the building can greatly reduce the number of idling vehicles. However, there is a unique challenge to creating such policies because the responsible party is often an event planner who has rented that site for a single event, not the local, onsite venue staff. Therefore, it is important for venue staff to provide suggestions and reminders to clients on how to reduce each event's environmental impact. In 2008, the Colorado Convention Center partnered with the City and County of Denver's Department of Environmental Health to reduce onsite commercial vehicle idling through a social marketing pilot program. Read about how they were successful in reducing both the percent and duration of idling vehicles. 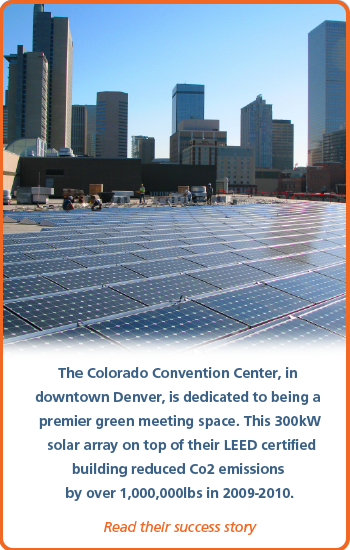 The lessons learned at the Colorado Convention Center may help you to implement a successful idle reduction campaign at your venue. Delivery vehicles and semi-trucks: Event planners (or the general service contractors who organize event set up and break down) can schedule drop off/pick up times with transportation vendors and supply a staging yard with parking spaces for vehicles that arrive early to eliminate unnecessary idling onsite while trucks are waiting to load or unload or pick up deliveries. Do not allow trucks to idle onsite. Charter buses and school buses: One of the toughest parties to convince to turn their engines off is bus drivers because they are concerned with maintaining a comfortable cabin temperature. Event planners can share the event schedule with bus drivers, so that they can arrive closer to when participants will need rides. Do not allow buses to idle onsite. Except on very hot days, turning a bus off for five minutes will not affect the cabin temperature. Be sure to also create a comfortable waiting lounge inside in the lobby for passengers, so they don't have to wait on the bus. Taxis, limos and shuttles: Just like bus drivers, taxi, limo, and shuttle drivers also idle their vehicles while waiting for passengers to maintain a comfortable temperature. Event planners can share the event schedule and transportation plan with taxi, limo, and shuttle companies, so that they can arrive closer to when participants will need rides, only if needed. Do not allow car service and shuttle vehicles to idle onsite. Consider arranging airport shuttle service for attendees to reduce the number of individual vehicles rented or hired. If participants from an event are coming from nearby, event planners can share contact information to encourage or coordinate carpooling to the event and reduce the number of vehicles used for event transportation. Read the US EPA's Green Meeting resources for more tips, tools and resources to make environmentally responsible choices. Check out the NEW Convention Industry Council's standards focused on sustainability called the Accepted Practices Exchange (APEX) Green Meeting Standard. Transit buses: Bus drivers typically idle to keep a comfortable temperature inside the bus. Venues can share the event schedule with bus drivers, so that they can arrive closer to when participants will need rides. Do not allow buses to idle onsite. Taxis, limos and shuttles: Just like bus drivers, taxi, limo, and shuttle drivers also idle their vehicles while waiting for passengers to maintain a comfortable temperature. Venues can share the event schedule and transportation plan with taxi, limo, and shuttle companies, so that they can arrive closer to when participants will need rides, only if needed. Do not allow car service and shuttle vehicles to idle onsite. Venues can also provide event planners with contact information for local airport shuttle companies when out-of-town travelers are scheduled so they can arrange shuttle service for attendees to reduce the number of individual vehicles rented or hired. As a venue, you can set a no idling policy and post signs around the property to notify visitors of the rule and consequences. Event staff should all be trained on the policy to be able to explain it to guests and enforce it, when necessary. If your venue is in a community with an idling ordinance, request that your local government give your security staff authority to write tickets to violators onsite to assist with enforcement of the law. Before you begin an idle reduction campaign at your venue, read the Lessons Learned from the Colorado Convention Center. You can make a few choices to reduce the amount of air pollution and greenhouse gas emissions you generate from your travel to, at, and from an event. If you are flying to an event, reserve an airport shuttle or carpool with other participants rather than renting a personal vehicle or taking a taxi to and from the airports on both ends of your travel to reduce the number of vehicles used for event-related transportation. Do not idle your vehicle while waiting for all of your passengers to return after the event.